That's a great analogy. Thank you for sharing it. This is a good story to learn from. I will have to share it with some of the people I train with. I would recommend Judo for reinsarting students. 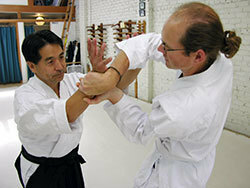 While the other martial arts mentioned are excellent, they rely on small joint manipulation most of the time. You will get in some serious trouble as a teacher if you strain or sprain a student's wrist or finger. However with Judo, you will learn quickly against a fully resisting opponent how to apply some pins that by design are meant to stop, not maim or kill. Granted, you could kill people with those pins if you really wanted to, but, that is not their primary aim. Your Wing Chung should already have some angle work and redirection. Whenever I am attacked by someone I don't really want to hurt, I use soft blocking and parrying. Do you have anything in your Wing Chung that resembles sticky hands? Use that sticking and trappling to cross a student's arms over their chest, move them into a wall and hold them their if needed. But go with Judo. It is a good complement to practically any strking art. Plus, the techniques, which includes the chokes, are not primarily meant to disable. Now be warned: you do a Judo THROW on a student, you're asking for serious trouble. But if you used a light-impact version of the throw to segue to the ground so that you could hold the student, or to move the student against a wall and into a corner, where you can restrain, that's better.If I were you, I'd talk to your school principal about what he/she would allow or not allow. Your principal may also be a martial artists -I have met quite a few who are. See what techniques would be allowed . I knew one principal who allowed blocking. That alone kept my children from being hurt. Good luck! And remember to take Judo AND talk to your principal.